Well-known, large, olive-green swimming crab, sharply serrated edges around front half of shell. To more than 200 mm across. 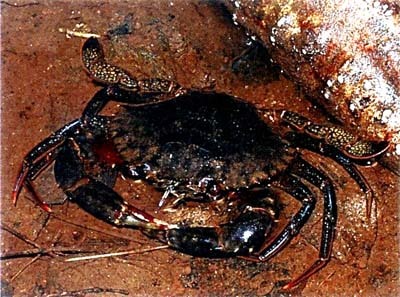 Popular food crab. Makes characteristic, large, oval burrows in banks in estuarine and mangrove areas, intertidal and subtidal zones. Semi-fossilised remains (1000–5000 years ago) found in sediments brought up during channel and coral dredging. North from about Sydney, NSW; Indo-West Pacific.